Here are a couple of articles about the Buffalo Field Campaign and how they, and other groups are funded. Contrary to popular belief BFC’s top paid people don’t make much money (trust me, I know this because I am on their Board of Directors). BFC is also very efficient with its money and has very resourceful people working to maintain and improve its cars and property. Most of its funds are spent on keeping people out in the field to document what happens to the buffalo and educating visitors to Yellowstone National Park and Grand Teton National Park during the summer months. Buffalo Field Campaign: On-the-ground activism. The Donor Dance: How green groups stay funded. Not surprisingly, the Montana Senate voted on a bill that would keep Montana Department of Fish, Wildlife and Parks from relocating bison anywhere in the state except for the National Bison Range in northwest Montana for the next two years. The Montana House has yet to pass any similar bill but there are many being considered. Governor Brian Schwietzer has promised to veto any bills of this nature. Senator Sharon Stewart-Peregoy, D-Crow Agency summed up what could result from this action. To rub it all in with a strong note of arrogance, Sen. John Brenden sang a couple of bars of “Home on the Range” to the protests of Democrats. If anyone thinks that western states aren’t run by the landed nobility you might want to think again. Update. Ralph Maughan on the teabagging Republican Brenden. Brenden Farms got almost $500,000 in farm subsidy payments from 1995-2009. That is about $34,000 a year. Over 15 years that would be an average of $33,152/Year. Some might call this federal government hater a hypocrite, and a mean one at that. This is a strange turn of events. 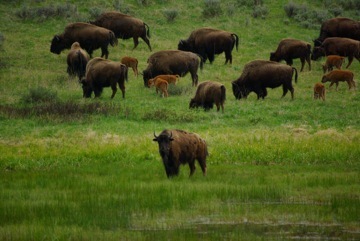 Montana gov blocks shipments of Yellowstone bison to slaughter, suggests park feed animals. 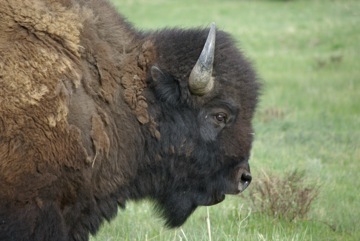 Greater Yellowstone Bison show signs of inbreeding. Government slaughter could irreparably harm bison species. Recently I referenced unpublished data indicating that bison suffer from compromised mitochondrial DNA which could be exacerbated by government slaughter without any examination as to how it will affect the already genetically compromised herd. That information has now been released.